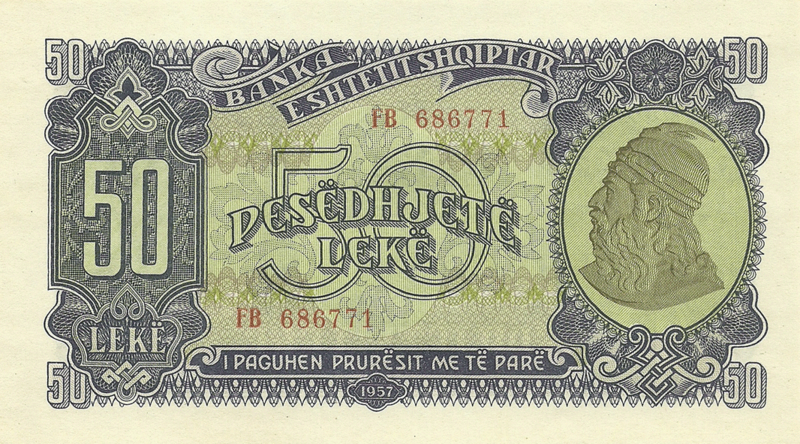 Abbreviation of Albanian State Bank B.SH.SH in a circle. On right side is Skanderbeg. George Castriot (Albanian: Gjergj Kastrioti, 6 May 1405 – 17 January 1468), known as Skanderbeg (Albanian: Skënderbej or Skënderbeu from Ottoman Turkish: اسکندر بگ‎, translit. İskender Beğ), was an Albanian nobleman and military commander, who served the Ottoman Empire in 1423-1443, the Republic of Venice in 1443-1447, and lastly the Kingdom of Naples until his death. After leaving Ottoman service, he led a rebellion against the Ottoman Empire in what is today Albania and North Macedonia. Skanderbeg always signed himself in Latin: Dominus Albaniae ("Lord of Albania"), and claimed no other titles but that in documents. A member of the noble Castriot family, he was sent to the Ottoman court as part of the Devshirme, where he was educated and entered the service of the Ottoman sultan for the next twenty years. He rose through the ranks, culminating in the appointment as sanjakbey (governor) of the Sanjak of Dibra in 1440. 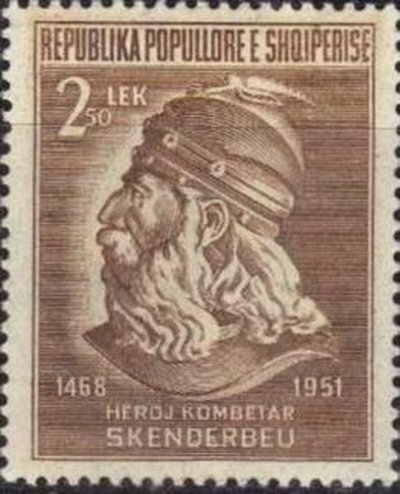 In 1443, he deserted the Ottomans during the Battle of Niš and became the ruler of Krujë, Svetigrad, and Modrič. In 1444, he was appointed the chief commander of the short-lived League of Lezhë that consolidated nobility throughout what is today Northern Albania. Thus, for the first time Albania was united under a single leader. Skanderbeg's rebellion was not a general uprising of Albanians, because he did not gain support in the Venetian-controlled north or in the Ottoman-controlled south. His followers included, apart from Albanians, also Slavs, Vlachs, and Greeks. Despite this military valor he was not able to do more than to hold his own possessions within the very small area in nowadays northern Albania where almost all of his victories against the Ottomans took place. His rebellion was a national rebellion. The resistance led by him brought Albanians of different regions and dialects together in a common cause, helping define the ethnic identity of the Albanians. Skanderbeg's military skills presented a major obstacle to Ottoman expansion, and he was considered by many in western Europe to be a model of Christian resistance against Muslims. For 25 years, from 1443 to 1468, Skanderbeg's 10,000 man army marched through Ottoman territory winning against consistently larger and better supplied Ottoman forces, for which he was admired. In 1451, he recognized de jure the sovereignty of the Kingdom of Naples over Albania through the Treaty of Gaeta, to ensure a protective alliance, although he remained a de facto independent ruler. In 1460-1461, he participated in Italy's civil wars in support of Ferdinand I of Naples. In 1463, he became the chief commander of the crusading forces of Pope Pius II, but the Pope died while the armies were still gathering. Together with Venetians he fought against the Ottomans during the Ottoman–Venetian War (1463-1479) until his death in January 1468. He ranks high in that military history, as the most persistent opponent of the Ottoman Empire in its heyday who was also ever-victorious. 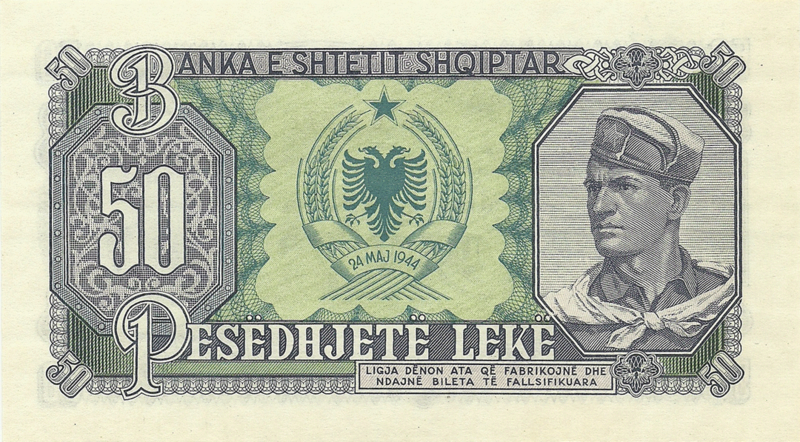 An inscription::"Banka e Shtetit Shqiptar. I Paguhet Prurёsit Me Tё Parё". 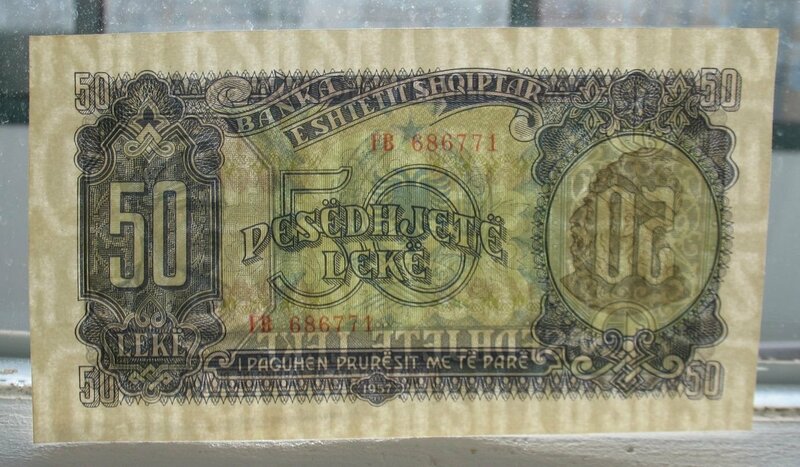 In English: "Bills of Albanian State Bank should be accepted everywhere in the country". Soldier in uniform of Albanian peoples army. Red tie means belong to the communist movement (since partisan detachments). On the basis of the partisan detachments, the formation of an army began, which, in 1945, began to receive Soviet-made weapons. On January 11, 1946, the People’s Republic of Albania was proclaimed. The armed forces of this republic were known as the Albanian Popular Army. After the end of the war, the international situation on the borders of Albania remained difficult due to the onset of the Cold War. On May 14, 1955, Albania joined the Warsaw Pact, December 14, 1955 was admitted to the UN. The collective security system reduced the risk of a direct armed attack on the country and reduced the number of armed forces. In the period from May 1955 to May 1958, the number of armed forces of Albania was reduced by 9 thousand people. On March 12, 1958, the Sport Committee of the Friendly Armies was created, in which the armed forces of Albania participated. In the late 1950s, relations between Albania and the USSR deteriorated, and in foreign policy the country shifted to the PRC. In 1961, Albania recalled the embassy from the USSR (after which cooperation with the USSR and the socialist countries of Eastern Europe was discontinued) and ceased military cooperation through the ATS, and since the beginning of 1962, economic interaction within the Council for Mutual Economic Assistance has almost completely ceased. The basis of domestic policy was proclaimed the idea of ​​"self-reliance". Centered is the Coat of arms of the People’s Socialist Republic of Albania 1946-1992. 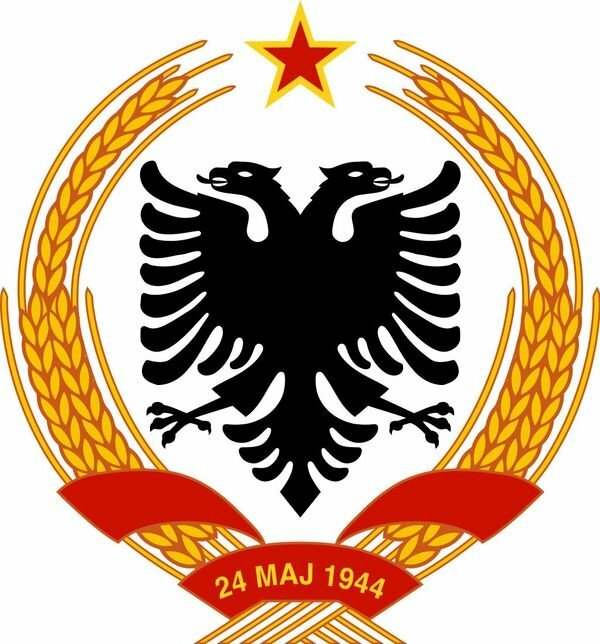 "The coat of arms of the People’s Socialist Republic of Albania is an image of a black double-headed eagle, framed by two bunches of wheat ears, which have a five-pointed red star at the top and are tied at the bottom with a red ribbon on which the date" May 24, 1944 "is written." Inscription at the bottom:"Ligja dёnon ata qё fabrikojnё dhe ndajne bileta tё fallsifikuara". In English: "Forgery of state bills is punishable by law". 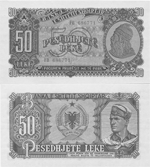 In 1949, a series of banknotes in denominations of 10, 50, 100, 500 and 1000 lekё were introduced. The second series with a similar design was introduced in 1957.